16 January 2019: H.E. Eng. 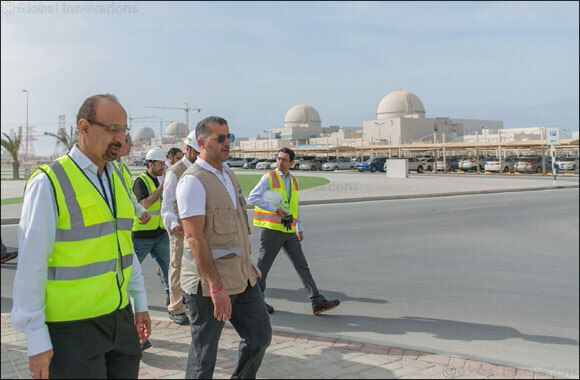 Khalid bin Abdulaziz Al-Falih, Minister of Energy, Industry, and Mineral Resources for the Kingdom of Saudi Arabia (KSA) expressed his appreciation for the significant development of the Barakah Nuclear Energy Plant in a recent visit to the UAE. H.E. Eng. Al Falih commended the Emirati workforce who are highly skilled in the nuclear sector and committed to developing their skills and knowledge. H.E. Eng. Al-Falih was briefed on the latest developments of the Barakah Plant, located in the Al Dhafra region of Abu Dhabi Emirate. H.E. Eng. Al-Falih and his delegation were received at the Barakah Nuclear Energy Plant by H.E. Eng. Mohamed Al Hammadi, Chief Executive Officer of ENEC; Mr. Nasser Al Nasseri, Chief Executive Officer of Barakah One Company; Mr. Mark Reddemann, Chief Executive Officer of Nawah Energy Company; and a number of senior management officials from ENEC and its subsidiaries. H.E. Eng. Al-Falih headed a visiting delegation from the KSA to participate in Abu Dhabi Sustainability Week and visit the Barakah Nuclear Energy Plant. The delegation included H.E. Dr. Khalid bin Saleh Al-Sultan, President of King Abdullah City for Atomic and Renewable Energy; Dr. Khalid Abdulaziz Al Eissa, Advisor to Minister of Energy, Industry, and Mineral Resources; Eng. Amin Mohammad Alshibani, Advisor to the Minister of Energy, Industry, and Mineral Resources; Dr. Muhammad Ahmad Garwan, Chief Executive Officer of the Renewable Energy Sector at King Abdullah City for Atomic and Renewable Energy; Dr. Maher Alodan, Chief Executive Officer of the Atomic Energy Sector in King Abdullah City for Atomic and Renewable Energy; Eng. Muhammad Saad Assaad, Head of Engineering and Projects Department at King Abdullah City for Atomic and Renewable Energy; and a number of specialists. During their visit, H.E. Eng. Al-Falih and the members of the delegation were briefed about the operational readiness activities that are ongoing at Unit 1, for which construction was completed in May 2018, as well as ENEC’s Emiratization and human capital development programs. The briefings also highlighted ENEC’s efforts to engage with local companies in order to develop a local nuclear energy supply chain – a key component in developing a sustainable peaceful nuclear energy program. H.E. Eng. Al-Falih and his accompanying delegation visited the Turbine Building, the Station Reactor Building, and the Main Control Room of Unit 1. H.E. Eng. Al-Falih thanked representatives from the Barakah Plant for organizing the visit. H.E. Eng. Al-Falih expressed his admiration for the progress achieved at the Barakah Nuclear Energy Plant, and the technology used in its construction. Al-Falih was proud to meet the talented Emiratis working on the project and praised their dedication and continuous efforts to gain knowledge and support the future development of their nation. “The success achieved at the Barakah Nuclear Energy Plant reinforced our belief in our capability to build two nuclear reactors in Saudi Arabia. In addition, we believe there is the potential for collaboration between the United Arab Emirates and Saudi Arabia in regulatory, operational, and security matters,” added H.E. Eng. Al-Falih. H.E. Minister of Energy, Industry, and Mineral Resources of Saudi Arabia, concluded his speech by wishing the UAE officials and the Emirati workforce continuous success. 'The Barakah Nuclear Energy Plant is being developed according to the highest international standards for quality and safety. The project has achieved many milestones due to our adherence to these standards and our cooperation with the various parties involved, including the International Atomic Energy Agency (IAEA), the World Association of Nuclear Operators (WANO), our Prime Contractor and Joint Venture Partner the Korea Electric Power Corporation (KEPCO), and other subcontractors and partners,” added H.E. Eng. Al Hammadi. The Barakah project is progressing steadily, with Unit 2 more than 94% complete, Unit 3 more than 86% complete, and Unit 4 more than 78% complete. As of the end of November 2018, the overall construction completion rate for the Barakah plant is more than 91%. The four Units, once operational, will provide around 25% of the UAE’s electricity needs while preventing the release of 21 million tons of carbon emissions annually, equivalent to removing 3.2 million cars from the nation’s roads.